My wife and I have owned three Volvos---a 244, 740, and 940. The glove box locks broke on two of them. One would think it would have been the plastic latch that would have broken . . . but no, instead it was the pot metal protrusion that goes into the plastic latch (Figure 1). This is certainly a design flaw on Volvo's part. Replacement locks can be gotten cheaply from junkyards, but of course, they will not be keyed to your specific key. 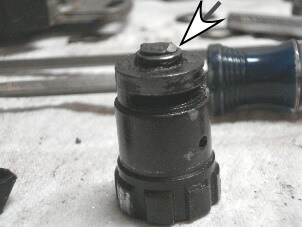 But, you can replace the key cylinder per below (Figure 4 on). Figure 1. 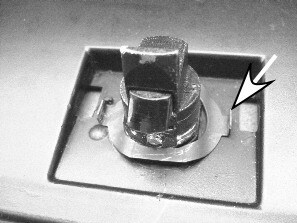 The arrow points to the broken pot metal protrusion of the glove box lock. If your lock is broken and you can't open the glove box, a former owner of our 940 suggested slipping some thin string along the top edge and along the sides of the glove box and working the string back toward the latch while pulling down. Play with it. You should be able to depress the plastic latch enough to open the compartment door. Figure 2. To remove the old glove box lock, drop compartment door and gently pry up cover plate (arrow) with small flat-bladed screwdriver. Figure 3. 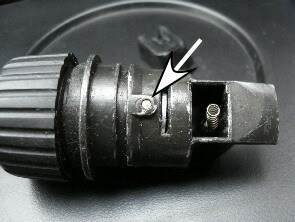 The retaining leaf spring (arrow) is shown in the locked position in photo at left. Rotate 90 degrees by pushing on it with a flat-bladed screwdriver or by turning it with a pair of pliers. Then press down on the plastic latch and pull lock free through front of compartment door. If you are not interested in having your ignition key open and lock the glove box, just replace the broken lock with the one from the junkyard using the procedures of Figures 2 and 3 in reverse. At least the glove box will be able to latch. If you want to be able to lock the glove box with your key, continue as below. Figure 4. You will be working with two locksets: the original broken one (A) with original key cylinder and the replacement working one (B) with non-original key cylinder. 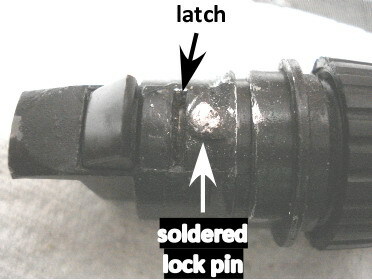 The whole lock assembly is held together by a lock pin (arrow). Set the lockset in a soft vise and use a 1/16" or 2-mm flat punch to drive the pin down and out. Figure 5. 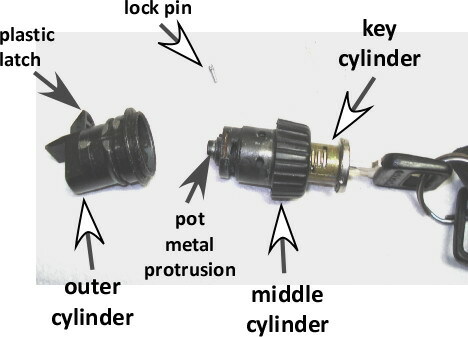 Once the lock pin is driven through, the whole mechanism disassembles in three parts: the outer cylinder holding the plastic latch, the middle cylinder with the pot metal protrusion, and the key cylinder with pins and springs. BE CAREFUL when pulling the key cylinder of A out as the pins and springs may tumble all over the place. No big deal for B, as you won't likely have the key for that cylinder. 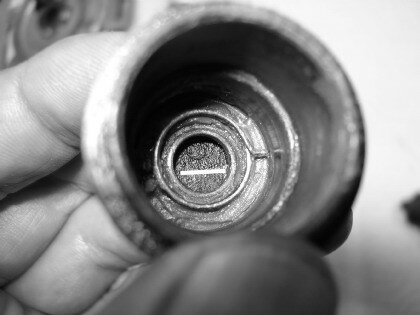 Carefully pull the key cylinder of A out by wrapping your fingers on both sides of the cylinder over the pins. Insert it into the new middle cylinder of B, which has the intact pot metal protrusion. Figure 7. 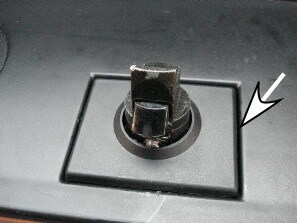 The knob on the glove box lock has a torsional spring action, readily apparent when you twirled the knob before disassembly. 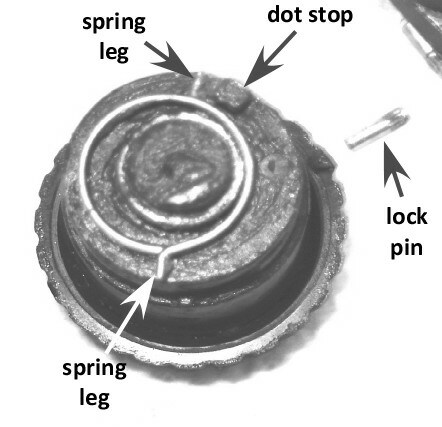 The best way to capture this spring action is to put the circular spring on the end of the middle cylinder, as shown here, with one spring leg that will catch on the small dot stop (arrow). Gently insert the middle cylinder (with key cylinder kept intact inside it) into outer cylinder and rotate the middle cylinder so that other leg of circular spring catches on dot stop at bottom of outer cylinder. Turn knob and check for spring tension. If none is there, pull middle cylinder out partway and re-insert it and try again to catch that dot stop with the spring leg. It may take several tries. Figure 8. Once you have all the cylinders together, check to see that the knob turns and that it has tension. Next, use your key and see if it raises and lowers the latch to lock and unlock the knob. When all these check out, put whole lock into a soft vise and gently tap the lock pin (striated, flared end first) into the hole. More than likely, the lock pin will be slightly loose. To ensure it stays put, solder the top with nonelectrical solder. File off excess solder. You're done! Install lock into glove box per reverse procedures of Figures 2 and 3.